At WRRC we concentrate on addressing the unique water and wastewater management problems and issues that we in the Pacific face. WRRC serves the state of Hawaii as well as other Pacific islands and elsewhere by researching water-related issues distinctive to these areas. We are Hawaii's link in a network represented in every state as well as Washington, D.C. and three U.S. territories. The centers are organized as the National Institutes for Water Resources. Funding comes from University appropriations, from a small federal program administered by the US Geological Survey and in largest part from external grants and contracts. Promote technology transfer and the dissemination and application of research results. Hawaii's culture and climate present unique issues and problems of water resource management. Rainfall events in the islands are often intense and short compared to most temperate climates. Hawaiian hydrogeology differs markedly from most other areas. We are almost entirely dependent on groundwater for our drinking water. The islands are closed systems, importing water is not feasible if we overuse or contaminate our aquifers. Our tropical climate permits the usual pollution indicator organisms to grow in the soil, compromising their usefulness for detecting pollution. Our tourism-based economy is dependent upon vigilant stewardship of our nearshore water quality. As a key element of traditional Hawaiian life, water, both fresh and ocean, plays a unique and important cultural role. At WRRC we concentrate on addressing the unique water and wastewater management problems and issues that we in the Pacific face. WRRC thus serves the state of Hawaii as well as other Pacific islands and elsewhere by researching water-related issues distinctive to these areas. 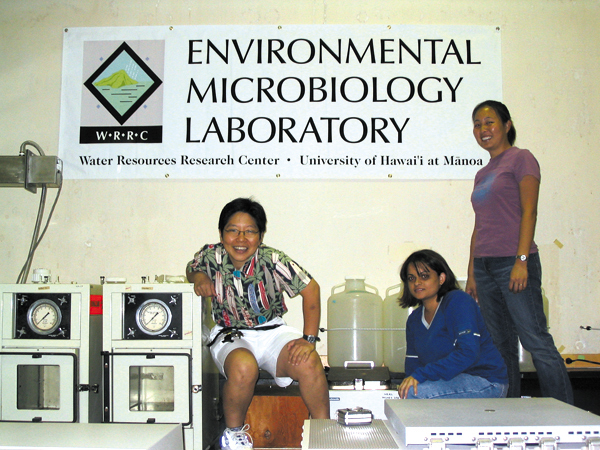 The University of Hawaii established WRRC in response to the Federal Water Resources Research Act of 1964 and the University's own Academic Development Plans. We are Hawaii's link in a network represented in every state as well as Washington, D.C. and three U.S. territories. The centers are organized as the National Institutes for Water Resources (click on the NIWR logo below.) Funding comes from University appropriations, from a small federal program administered by the US Geological Survey and in largest part from external grants and contracts. Currently, eleven faculty researchers, most of whom hold joint appointments with instructional departments, and several staff members join varying numbers of faculty and staff from other units of the UH system in research, service and education projects. Our Information and Technology Transfer Office provides a TT specialist as well as a publications staff. As an independent research unit at UH-Manoa, WRRC reports to the Office of the Chancellor, and is thus well positioned to encourage the multidisciplinary research necessary to such a multifaceted resource. Since 1989, WRRC has been home to the UH Environmental Center, expanding our mission to include research and education in ecological relationships, natural resources and environmental quality, focused on people and social institutions. The Environmental Center also administers self-designed bachelor's degree and certificate programs in Environmental Studies. Facilities of WRRC include well-equipped analytical laboratories for environmental virology, water bacteriology, water quality, soil hydrology, and toxic chemicals. 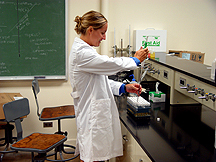 Access to other UH laboratory space can often be arranged as needed. Small research installations are located at numerous points around Oahu. The WRRC Analytical Laboratory is housed in 700 sq. ft. of space in the engineering building, Holmes Hall, room 181. WRRC works closely with the department of Civil and Environmental Engineering, and, together, they have furnished the laboratory with up-to-date, and state-of-the-art, equipment for the analysis of environmental pollutants at trace levels of parts per million (ppm), parts per billion (ppb), and even parts per trillion (ppt). This includes Volatile and Semi Volatile Organic compounds like Petroleum Hydrocarbons, Industrial Solvents, Explosives, Pharmaceuticals & Personal Care Products (PPCPs), and Endocrine Disruptors like Organochlorine Pesticides, Polychlorinated Biphenyls (PCBs), Polynuclear Aromatic Hydrocarbons (PAHs). Extensively renovated and updated in 2004, WRRC's microbiology laboratory is capable of performing microbiological as well as some molecular biological analyses such as polymerase chain reaction (PCR). The lab is equipped with a PCR thermal cycler; electrophoresis equipment; and a low-pressure, low intensity UV, and a medium pressure, high-intensity UV, collimated beam unit (used to test the disinfection capabilities of ultraviolet light). Of course the lab is also equipped with the standard micro lab necessities (a biological safety hood, aerobic and anaerobic incubators, water baths, microscopes, membrane filtration apparatus, tabletop centrifuges, and storage refrigerators.) For rapid water quality testing to detect coliforms and E. coli, the Colilert system is used in this lab. Likewise, the Microtox bioassay testing system is used for toxicity screening of water samples (marine or fresh). The WRRC library located in Holmes Hall 285, is a repository for the more than 400 reports produced by WRRC researchers since the Center's establishment. 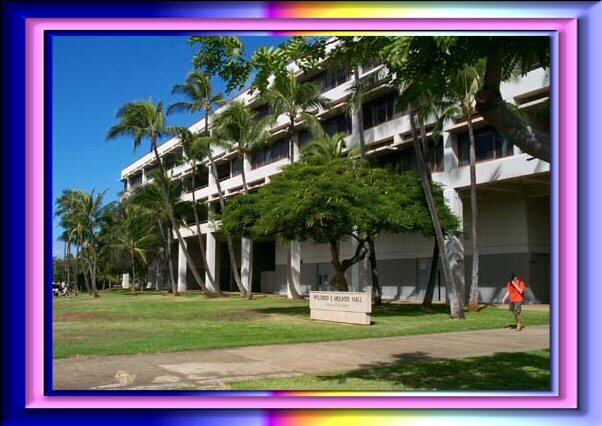 The Center's offices, library and laboratories are located on the UH-Manoa campus, in Holmes Hall. Most faculty have offices with their instructional department. Please familiarize yourself with the admissions requirements of the campus to which you are applying by visiting the campus’ online admissions office. Applicants to any of the ten campuses of the University of Hawai‘i may choose to apply online. All University of Hawai‘i campuses use the same System Application Form forundergraduate enrollment, however, applications are submitted to and processed by each individual campus. The UH System offers graduate studies at UH Manoa, UH Hilo and through our three University Centers. Visit the online admissions office of the campus you are interested in attending.